New Society Publishers - New Society Publishe, 9780865717046, 434pp. Techno-Fix questions a primary paradigm of our age: that advanced technology will extricate us from an ever increasing load of social, environmental, and economic ills. Techno-Fix shows why negative unintended consequences of science and technology are inherently unavoidable and unpredictable, why counter-technologies, techno-fixes, and efficiency improvements do not offer lasting solutions, and why modern technology, in the presence of continued economic growth, does not promote sustainability but instead hastens collapse. The authors explore the reasons for the uncritical acceptance of new technologies; show that technological optimism is based on ignorance and that increasing consumerism and materialism, which have been facilitated by science and technology, have failed to increase happiness. The common belief that technological change is inevitable is questioned, the myth of the value-neutrality of technology is exposed and the ethics of the technological imperative: "what can be done should be done" is challenged. Techno-Fix asserts that science and technology, as currently practiced, cannot solve the many serious problems we face and that a paradigm shift is needed to reorient science and technology in a more socially responsible and environmentally sustainable direction. The readers of Techno-Fix will learn a number of inconvenient truths about science and technology, topics that are rarely, if ever, covered in the media or discussed among professionals. Readers will be challenged to re-examine their current worldview, their paradigms and assumptions about the so-called promises of modern technology. But they will also feel empowered and inspired by the fact that most problems confronting humanity have inherently simple, low-tech solutions. The authors of Techno-Fix, both Ph.D.s, have decades of experience in science and engineering, and deliver a highly readable, insightful and powerful critique of modern technology. Techno-Fix has been endorsed by Richard Heinberg, Bill McKibben, David Suzuki, William Rees, and other notables in the environmental and academic community. DAVID SUZUKI Canadian environmental activist, professor emeritus, University of British Columbia, host of CBC’s The Nature of Things, author of 43 books, recipient of 25 honorary doctorates as well as numerous awards, including the Order of Canada. BILL MCKIBBEN Journalist, environmental activist, Schumann Distinguished Scholar at Middlebury College, author of many influential books and articles, including The End of Nature and Eaarth: Making a Life on a Tough New Planet. Technology has become our near-universal object of faith: new machines (whether solar panels or iPads) will solve all our problems! Few of us seem to understand that machines have in fact exacerbated most of our current environmental and social problems, and it is people who must provide the answers. It is our appetites and economic arrangementsnot our gadgetsthat must change if we are to survive. Michael and Joyce Huesemann argue this controversial thesis clearly, convincingly, and entertainingly. Their book deserves to be read and discussed in every home, school, and legislature. RICHARD HEINBERG American journalist, Senior Fellow at the Post Carbon Institute, and author of ten influential books including The Party’s Over. Peak Everything, and The End of Growth. In Techno-Fix, Michael and Joyce Huesemann show us how unsustainable and destructive technologies, shaped and driven by the profit motive, have emerged as a major cause of harm to the health of people and the earth. We need to go beyond a blind Techno-religion. We ourselves need to choose the tools that shape our lives. A vibrant and vital democracy needs people's participation in technology choice. Techno-Fix shows how. VANDANA SHIVA New Delhi based environmental and anti-globalization activist, philosopher, author of 20 books including Soil not Oil and Staying Alive, and recipient of numerous international awards. Even as the impacts of technology destroy the ecosphere, the faithful preach that technology alone can salvage civilization. Enter Michael Huesemann and Joyce Huesemann. With Techno-Fix: Why Technology Won’t Save Us or the Environment the Huesemanns have produced one of the most well-researched and possibly the best myth-busting book the environmental movement has ever seen. In a better world, it would be required reading for all elected officials and every student in every program at every university everywhere. Techno-Fix deals with a wide range of issues at the core of the sustainability crisis, showing that these problems are not going to be solved by technical advances which leave the fundamental structures and values of rampant consumer society in place. It presents a detailed and powerful case, based on extensive references to supporting studies and evidence, and expressed in a clear and easily readable style. The alarming problems now accelerating on many fronts are not basically technical problems. They are mostly created by the mistaken goals we have chosen to pursue, especially the pursuit of limitless affluence and economic growth. Unfortunately mainstream thinking seems to be about as far from recognizing this as it ever was, and its main support derives from faith in technology. It seems to be generally believed that our wizard scientists will come up with ways whereby we can all go on merrily getting richer with no end in sight, and the poor of the world would rise to live as we do. This book provides a very effective refutation of this willful, deeply entrenched and rarely questioned delusion. The nuclear disaster of Fukushima tragically confirms how right the authors are. Ernst Ulrich von Weizsaecker German scientist, academician, parliamentarian, and author of influential books including Earth Politics and Factor Four; founder and former president of the Wuppertal Institute and member of the Club of Rome. was originated by environmentalists, but it has been adopted by technophiles because it equates technology with population as equal determinants of the environmental impact of growth and change. The problem is that: (1) It assumes a linear relationship among the variables, while the real world is non-linear, marked by thresholds of damage and changing impacts as the scale changes. (2) The range of impacts of the three variables is dramatically different. Population change affects most biological, social and economic interactions, whereas a given technological change by itself influences a much narrower band, and the net impact of technological change as a whole is incalculable. Even using the original formula whose assumptions could be made considerably stronger, the book successfully refutes the belief that technology is a cure for growth. The authors write from broad practical and academic qualifications. The book is also valuable in offering, not just the authors’ views, but the viewpoints of many well-known writers on population change and its consequences. That in itself should make it valuable as a textbook for courses on population, environment or resources indeed for courses in current history, which too often ignore those critical determinants of our future. Teachers in all those areas will find it useful for their own education. JOHN ROBBINS Environmentalist, animal activist, and author of numerous bestselling books including Diet for a New America and The Food Revolution. Robbins has received the Rachel Carson Award and the Albert Schweitzer Humanitarian Award. 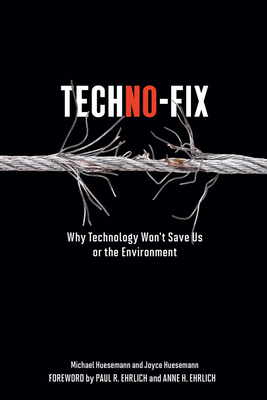 Techno-Fix explains why science and technology will not save the economy or the environment. Drs. Michael and Joyce Huesemann have written an outstanding book that is most timely. DAVID PIMENTEL Professor emeritus, Cornell University, author with Marcia Pimentel of Food, Energy, and Society and numerous other works on ecological integrity, pesticides, biofuels, energy flows in food production, human population growth and the environment.